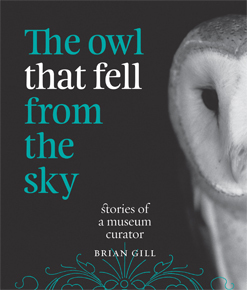 Natural history museums contain many thousands of zoological specimens and each has a tale to tell – often involving extraordinary people, daring explorations, unquenchable scientific curiosity, and strange coincidences.” Such is the publisher’s blurb accompanying The Owl that Fell From the sky: Stories of a museum curator and such is the case. This is a delightful and engaging book by an expert scientist and experienced author who has drawn from his long career as curator of birds and other land vertebrates at Auckland Museum, an accessible insight into the esoteric world of the ‘keeper’. Brian Gill has written and co-authored several useful books about New Zealand fauna, including The Kiwi and Other Flightless Birds and New Zealand Frogs and Reptiles, but this is more in keeping with his popular articles for New Zealand Geographic and Forest and Bird, where his personality shines through. It fits perfectly into Awa Press’s ‘popular science’ category, which is very much aimed at the general public and it uses the oldest trick in the book, telling a good story; in fact, telling lots of them! The story that gives the book its title is about the mysterious appearance of a European barn owl found near the mouth of the Haast River on the West Coast. This is a species which is found throughout the rest of the world, but not in New Zealand. And therein lies both the mystery and satisfaction of uncovering the solution, through the careful pursuit of science and inquiry. In this case it was meteorologists who unmasked the crucial evidence that ascertained that the owl had come from Australia. It is not the only Australian expat. encountered in the many great tales about turtles, snakes, elephants and other creatures, especially birds, that parade through the book, enlivened by Gill’s acute and humorous observations. Gill describes another, far less welcome, Aussie alien in the banjo frog, an aggressive species which would threaten our own ancient and endemic species. However what makes this book more than simply a collection of stories, is the way they are structured to reveal what taxonomy is, its history in New Zealand, and the vital importance of curators to explain and interpret the collections. Gill provides readers with many examples of the knowledge obtained by looking at the backgrounds of the specimens that come to a natural history museum, and how experts investigate their history and find out where they originated. He makes it clear that taxonomy backed by DNA studies is showing us how we fit into the natural world, refuting Lord Rutherford’s dismissal of taxonomy as a kind of “stamp collecting”. You might think that this could be taken for granted, but in a recent NZ Listener article Karl du Fresne expresses concern that the new regime in Wellington’s Te Papa is moving the “national” museum towards popular culture at the expense of science. It is a worrying move and comes at a particularly inopportune time because we are beginning to learn a great deal more about the history and pre-history of life in these islands. Earlier administrators of Te Papa set up an excellent exhibition to illustrate the way that continental drift through the millennia has formed our land. It should now be possible to take that story much further and develop the ways that Gondwanaland and Zealandia have shaped the local natural world down the millennia as outlined by Wellington bio-geologist George Gibbs in his recently reprinted (2011) book Ghosts of Gondwana. Extending the existing geographical Te Papa exhibitions to illustrate this knowledge of the way our biomass has changed could give the museum a new lease of life. This selection of vignettes about specimens and how they have been displayed here and throughout the world, has prompted me to want to abandon Te Papa and visit the Auckland museum. Jim Hefford is a retired GP living in Wellington. Not to mention botanical specimens!